My husband was picked up by ICE over a year ago. They were waiting for him outside our house. 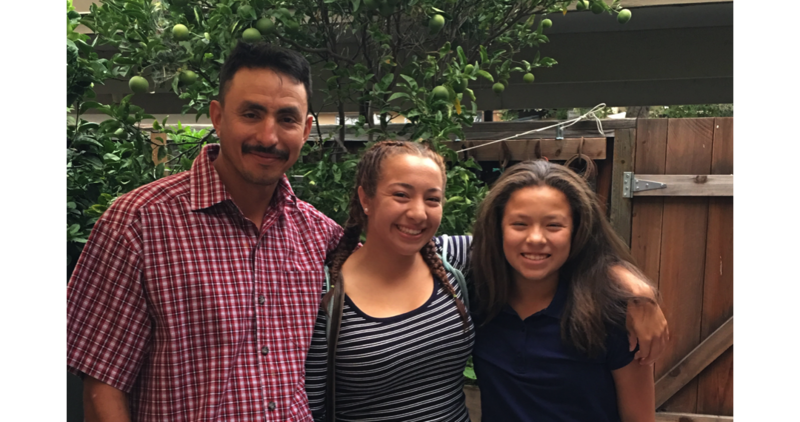 Christina Mendoza was driving her kids to school when her thirty-five year-old husband, Crispin, called to tell her he’d been picked up by ICE on his way to work. It was one of the worst days of my life. That morning, Crispin left for work as usual — he had a job as a roofer — and an hour later, when I was in the car driving my daughter and a couple other kids to school, he called me. It was a very short conversation. He told me that when he’d left, he’d seen a car on our street parked near his, and when he drove to the corner, it followed and stopped him. It was ICE, and clearly they had been waiting for him. He said he was being taken to San Francisco for processing, and that’s all he knew. I was born in the U.S. I met my husband in Pittsburg in 2001; he’d moved there from Mexico a couple years earlier. We married two years later and then moved to Hayward. I have two children from a prior relationship, a daughter and a son; Crispin is the father of my youngest daughter, Aiyana, who is thirteen years old. After I hung up with Crispin, Aiyana could tell something was wrong. She asked if I was OK — if her dad was OK.
Later, after I got to work (I am a manager for a pediatric dental office), I pretty much fell apart. I kept waiting for Crispin to call back, and finally I phoned the ICE office in San Francisco. I spoke to a U.S. Marshal who said my husband was going to be transferred to the West County Detention Facility in Richmond. I sat down with my daughters that evening and told them the news. Immediately, they started crying. They asked questions: Were we going to have to move? Would he be coming back? Would they have to leave school? I couldn’t answer. I could only tell them I didn’t know what was going to happen. My daughters came with me the first time we visited Crispin. I was confused; I didn’t know what we would encounter, or whether we’d be able to hug and touch him. We were seated at a table separated from Crispin by a sheet of plexiglass. It was so noisy we could barely hear each other speak. I was worried and wanted to know what we should do and whom I could ask for money, for help. He tried to comfort our daughters, telling them everything would be OK. He filed for asylum as soon as he could. He was informed he had a case, and he found a lawyer. I told the lawyer I only had $500 — and was very grateful when he agreed to help us. Crispin’s hearing was July 6th and he was denied both asylum and a bond. We’re appealing his case and the status is unknown. But even though I keep calling his lawyer, I haven’t heard anything. At this point, all we can do is wait. In terms of how he’s doing … I think he has his days. He doesn’t talk about conditions at the detention facility, and I don’t ask. He keeps himself busy as best he can. He has a lot of faith and doesn’t give up easily. He’s going to fight for as long as it takes. My greatest fear is that he will be deported and never come back. And I could never move to Mexico. We wouldn’t be able to blend in there. My daughters don’t speak Spanish. And I would be putting their lives in jeopardy. My husband’s cousin was murdered in Uruapan Michoacán and family members have been kidnapped. Since we’re from the United States, people there would think we are rich and I am afraid we would be in danger. Many women whose husbands are detained are undocumented themselves. They may not be able to speak English, they may not have a job, and they are afraid to visit their husbands because they don’t have the right kind of identification. Here, at least I have a job and two brothers who are helping me financially. I’m also receiving support from the community, my friends and my daughter’s school. As terrible as our situation is, I know we are luckier than others caught in the ICE system. My husband is still in shock. And afraid - both for himself and for us. If I get deported, I'm coming right back to the U.S. I have to. This is where my wife and children are.